The humble three speed was the way people got around for many years without much complaint before the proliferation of derailleur geared bikes in the 1970’s. Now we think we can’t ride a bike without the maximum amount of gears possible. But there’s a beautiful simplicity in having only three speeds. Before the three speed internally geared hub, bikes had but one single gear. While one gear is adequate for many purposes, the addition of two more gears, one for climbing hills, and one for powering on flats or going downhill, opened up a new world of opportunities. From the years between “the wars” up until the ten speed boom starting in earnest in the 1960’s, the three speed bicycle was king in Britain. It was an affordable way for the working class to get around, whether to commute to work or more leisurely jaunts into the countryside. American companies did make their own three speed models, with dubious results. If you’re looking at old American built (vs. rebadged) three speeds, Schwinn was the best as they turned out bikes on par with Raleigh, although even heavier if they were an Electro-Forged model. (I know there’s some fillet brazed and lugged American-made Schwinn three speeds out there, but oh man, they are very rare.) The Columbia Sports III with Sturmey hubs seem to be OK too. Other US makes and models should get the job done if they are in good shape, but I wouldn’t spend a lot on purchase and/or restoration. Other nations built three speed bikes too! Many Dutch city bikes have three speed hubs, along with German ones. Japan as well. You will sometimes see a 1970s era Japanese three speed on your local Craigslist. My roommate owns a Norwegian model from the mid-century with a Sachs Torpedo three speed hub. Even the derailleur obsessed French had some Sturmey-Archer equipped city bikes! I’ve ridden three speed bicycles around Portland for years and have found it perfectly sufficient for my day-to-day needs. The low gear does remarkably well on most hills. When I ride my 12 speed derailleured bike, I’m constantly shifting, trying to find the perfect gear. With my three speed, I mostly have it in middle gear, only switching to low when I encounter a hill and to high when I need to power along. If I was going to ride long distances or in really hilly terrain, my derailleur bike would be the appropriate tool for the job. But for around town, the three speed is ample and able. But three speeds are also good for longer rides! As long as the hills are not too steep, one can go quite far on one. In fact, during the middle part of the 20th Century many British folks would tour the countryside on laden three speeds. If they hit a hill too steep, they walked until they could pedal again. I’ve done rides up to 50 miles on a three speed. Distance is possible. These bikes are remarkable! I agree that pootling about can mostly be done in middle / 2nd / Normal(N) gear, and this is especially true if one fits the largest readily available sprocket, which has 22 teeth. I find this ideal for slower cycling, and especially on a traditional English carrier cycle. Regarding the Dutch city bikes, in face the vast majority have single speed coaster-brake hubs, usually from Sachs/SRAM. Yes to the 22 tooth sprocket! That’s what I have on my Raleigh Wayfarer. Simple to use without any doubts about which gear you need to be in on any hill, they have no redundant gears. Many of the derailleur gears have overlapping ranges and so really do not deliver a different gear from another gear number. The chain line is always perfect, which reduces wear on the chain. They can accommodate coaster brakes which are very low maintenance and do not grind down the rims. You can downshift without spinning the cranks, so you can go as far as possible in high gear up a hill until you lose your momentum, and then instantly downshift to first to continue where you would be unable to shift with a derailleur if you can no longer pedal. You can downshift for a quick startup at a stop light or stop sign, while standing still. The gear range of a typical wide range three speed hub, like the ubiquitous Sturmey-Archer AW, covers most of the range of the typical ten-speed, with the exception of the highest and lowest. (If you change the range, you can have as high or low a gear as a ten speed +, with more of a shift at the other end of the range.) The gear range is adequate for 95% of the hills I encounter in Pennsylvania, and the few which are too steep for my first gear are so steep I would often walk up them even with lower geared bike. Really low gears cause bikes to move so slowly that they are wobbly and unstable, and I prefer to walk when I can stop to rest and not feel compelled to push on to exhaustion so as not to have to stop and restart–always hard on a steep hill. On folding bikes, the three speed hubs are cleaner with less exposed greasy parts–easier to take inside without worries about smearing grease around. In short, I love internal hub gears, and three speeds are the most basic among these, with the quickest shifts and easiest maintenance. Many is the time I have walked rather than ride a derailleur bike when my three speed was not operational. I highly recommend them to all cyclists from 5 to 105. Thank you Keith for such thorough advice. I might be purchasing a 3 speed folding Boston Montague and your article made me recall how easy cycling used to be when I was a young woman. Great post. Just the information I’ve been looking for. I’m considering a trike purchase, to get more exercise, and enjoy the beach. I walk with crutches, so bicycle isn’t really an option. I wasn’t sure how 3-speed shifters work. Heck, dunno how bikes work! OK. Time to buy me a folding trike. I’m totally sold on the 3-speed concept. I started riding – and obsessing about – bikes in the derailleur-crazy 70’s and always had in the back of my mind that an internally geared hub would “blow up” if you stood up on the cranks or rode agressively at all. After more than 4 years of performance-oriented riding on a Motobecane with a Nexus 3-speed hub, I can state that it just ain’t so. Go back to exposed, dirt-collecting, gritty gear systems? Not on your life, Babalu! I’ve done a fair amount of experimenting with chainwheel and rear cog variations, and my preference, if anybody’s interested is 32 / 20 for 700c, 33 / 20 for 26″. Any decent bicyle shop sells them, although they may have to order it. Gazelle makes a nice but expensive 3 speed, so does WorkCycle ( Azor Opa ). I was first thinking of getting a Dutch-style one-speed, but I’m 59 years old, lots of hills in my part of town and my knees aren’t what they used to be! So 3-speed seems to be the way to go! I’m looking at the Windsor Oxford or Motobecane Bistro 3 at bikesdirect.com. Nashbar.com has some 3-Speed Gran Royale Aristocrat bikes. All reasonably priced. Otherwise, I certainly don’t see 3-speeds in any bricks-and-mortar bike shops. I just bought a Biria 3 speed Easy Boarding bike. Love it. I’m 66 and it is great. It was even recommended by Harvard Medical for seniors. Check out Biria.com to find a dealer or just Google it. This site is a great idea. I will not be attending your activities as I live in Ohio, but I enjoy reading what others are doing. I just found an old Triumph. It is step through, blue, Brooks seat (not leather), three speed. It shifts quietly, rides very well. And it cost far far far less than these new ones I see are made now (Pashley, Gazelle). I am sure that these are nice bikes but I could not justify spending 15 times what I did. I thought long and hard about the step through. But as I get older I will appreciate it. Plus, when I have a load on the back rack, mounting will be easier. With some degree of humor I noticed that all of Pashley’s work bikes are step through. With these they show males but with standard step throughs they show ladies. It is an interesting world. II found this site while looking for a three-speed electric bike. I have an EBike with derailleur gears, which involves constant changing up and down, when used in town. Fashion seems to dictate that bikes must have these gears. The more thoughtful of the bike producers make bikes with three gears or two-speed auto-change, but they seem to be sneered at. In the USA is a man called Tora, who produces a really good bike – Juiced Riders. He has thought it all through and, if I had the money, I would import one to the UK. My brother is now considering an EBike, which is how I ended up here, looking for info. I would recommend one to any of your previous posters with dodgy knees etc – I know what it’s like! An EBike can transform your cycling habits, with only a slight increase in consumption of the world’s resources. Hello, I was wondering if you ever did buy a 3-speed electric bike, and if you can recommend any? That’s what I’m looking for now. I tried a 24-speed ebike last week (BH E-motion Evo Jet Pro) and found all the gears really annoying. I don’t need them. But I live on a large hill so I’m looking for an ebike that can get me up the last bit to my house. Any advice welcome. All the best. Bought a 3 speed for use as a bicycle snow plow because bike paths aren’t plowed in my area. Used a single speed cruiser (crank bearings went) but lower gears needed for two foot deep drifts when pulling a bike plow. Also needed higher gear for light snow or commuting so a 3 speed suits this type of use well. Last 3 speed had derailleur gears too. Being able to shift gears anytime is very important when winter biking in snow drifts. Can still do comparable speed to my 21 speed bike. 3 speeds are great commuter bikes. Are there any 3 speed bikes for light trail or medium off-road riding? I have not been able to find one. Just street bikes. Thanks. You’d be surprised how versatile a standard old British three-speed is. I’ve definitely done my share of dirt/gravel roads. But there is no ready made MTB-esque bikes with three-speed hub. Best bet is to build up one. Something like a Surly Troll or Ogre would work. Thanks for the reply–that explains why I couldn’t find one. In lieu of that, your idea of building one up is a good one. I just think they are more fun to ride! My first three speed was a used Huffy Sportsman in 1969. I rode that bike hard for 3 years on and off pavement. The AW-3 developed what I have since learned is a characteristic skip that caused me several painful encounters with the frame’s top tube. In spite of that I still liked the 3 speed concept. Touring Europe in 1979 I saw lots of English and German teens on their “sit up and begs” or pushing them up the last steep hill to the youth hostel. When I moved from suburbs to the city I dreamed about a light stiff commuter bike with a planetary hub and coaster brake, but that was the advent of mountain bikes. So, I succumbed to another used Raleigh Sports. My nutty professor bike that no one would want to steal, until every hipster without a fixie appeared on one. After nearly 30 years it is my daily ride in sun, rain or snow, bare or towing cargo. It isn’t pretty any longer but it always starts, always stops and always shifts. It does everything I need here in Buffalo where the terrain rises less than 100 feet above the lake. Maybe I should buy that $45 Sports on craigslist just for the spare parts. 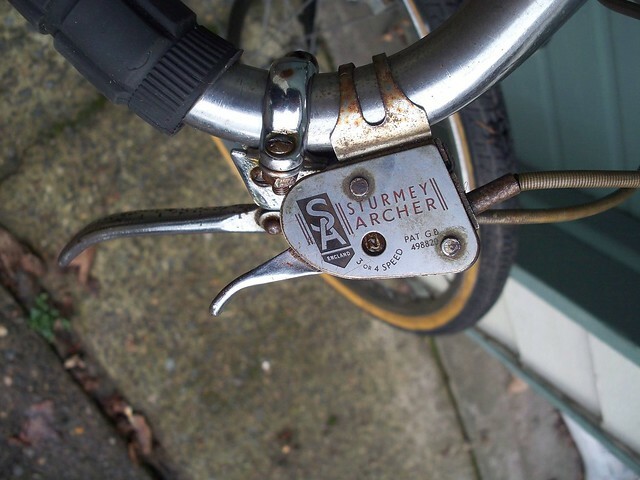 Offroad 3 speed Sturmey Archer AW’s. I raced mountain bikes in Northern California during the late 70’s and early 80’s up until and just after NORBA was started. AW hubs were very popular for use on early mountain bikes and were very successful on the race courses. In those days every class was lumped together and you always had one speed and 3 speed finishers in the top 10 at every race. What I noticed was that NORBA was used to separate the derailleur bikes away from one and 3 speeds because it is hard to sell derailleur products when you cant beat a one or 3 speed on course. So use that 3 speed off road all you like. I have ridden three speeders for years and I have just bought a Pashley princess classic (three speed) to replace my elderly Raleigh superbe. I love the princess, but I cannot bear to part with my Raleigh. She has been part of me for the past 30 years. Time for a refurb I think. There is nothing like a three speeder, I love going up and down the gears, the hub on the Pashley is silky smooth and I can shift while stationary without having to knock the pedals back. It is 50 years since I rode my first three speed bike. At high school I owned a single speed roadster. The majority of my school chums had three speed roadsters in those days and bikes with deauralieur gear systems were not very common. I really wanted to have a go on a three speeder to see what it was like, so one of my classmates allowed me to borrow his bike. He was the same height as me, so the bike suited me. It was a lovely metalic red Raleigh Trent tourist matching mudguards, white wall tyres, a hub dynamo for the lights built into the front wheel, slightly ‘swept back’ chrome handlebars with nice comfortable white plastic handlebar grips and a big chome headlight below the handlebars. The bike had a lovely big chrome bell on the left of the handlebars and the three speed shifter near the right handlebar grip. The saddle was a lovely wide soft ‘Lycett’ with two large chrome coil springs at the back. It was padded I think with horse hair covered with pvc on top of a lattice work of springs stretched from front to back of the saddle frame. I fitted a large saddle bag when the bike later became mine. The bike also had a rear carrier. My pal said make sure you stop pedalling or back pedal before you change gear and leave the bike in 3rd gear when you park up, taking the strain off the gear cable. I rode away on his bike and the first thing that struck me was how wonderfully comfortable the saddle was. Also, it took me a little while to get going as I was in 3rd gear, the gear most people parked their three speeders in.. I was not used to getting her into 1st gear before I started riding. I back pedalled and dropped down into second then first gear. I built up speed and went back up the gears, I remember how wonderfull the bike felt and I remember getting up quite a speed in third gear. I remember fumbling with the gears at first but after a little while they became second nature to me, when I got used to the bike, later I would knock the pedals back and shift her into 1st gear before I started riding The saddle was so comfortable its springs insulated me from any bumps in the road and with the bikes upright riding position, it felt like riding a dream. My pal was kind enough to allow me to use his bike on a regular basis and I borrowed his bike to cycle home rom school for my dinner. I remember eating my dinner as fast as I could so I could spend more time riding this lovely bike and I always took the long way back to school. My pal later allowed me to borrow his bike at the weekend when I would dissapear on it for the day. Eventually he told me he was having a shinny new racing bike with ‘dropped handlebars’ and would I like his Raleigh, to which I had become so attached. I didn’t need to think twice and I was absolutely delighted at what became ‘my’ Raleigh Trent tourist transported me over many miles for the next twenty odd years. I went touring and camping on it and she was my transport to and from work for many years. I did add some battery lights though, the idea of the lights going out when I stopped made me feel uneasy so I had the dynamo lighting as well. I have tried other bikes. Racing, hybrids and MTB’s even a Moulton, but I always came back to and prefer a three speed roadster bike. My ideal bike has a three speed hub, north road handlebars and a sprung saddle all of which my current Pashley Princess has. Could someone enlighten me a bit here…I am just converting an old Falcon to a 3-speed SA. Quite hilly where we are and some have suggested a larger rear cog to make one flat and two sort of climbing gears. How does this work. I mean how does it alter the shifting configuration. I think normally the middle position is your flat gear (number 2). Does this alter. To get lower gearing (meaning easier for hills) you can either make the rear cogs bigger and/or the front chainring smaller. If you have a multi-speed bike with a cassette in the rear and multiple chainrings in the front, the easiest gear would be the biggest cog in back, smallest chainring in front. With a three speed, you can change either/or rear cog and front chainring. Since most old three speeds are cottered cranks, it’s harder to find a smaller chainring since there were only a few different choices (usually 46 or 48 tooth) available, to get smaller you’d have to convert to a modern cotterless crankset. So changing to a larger rear cog is easier. Most Raleighs came standard with an 18 tooth cog, so it’s recommended to go up to a 22. On my three speed (Raleigh Wayfarer) I have a 46 tooth chainring and a 23 cog in the rear. This gives gearing of (from low to high, in gear-inches) 38.9, 51.8, 69.1 Now 38.9 isn’t super-low (my touring bike got down to 17) but it is pretty good for a lot of riding. I’ve done a loaded tour on it with grades up to 8%. You’d probably still have to walk super-steep hills. One word of caution with Sturmey-Archer hubs: It is not recommended to go lower than a 2:1 ratio (front:rear) because the internals of the hub can be compromised. I’m right at 2:1 with 46 in front, 23 in rear. So it’s tempting to put a real big cog on the rear, but things can happen. I have managed to snag a 1995 SA 3 speed. I have a 22 tooth cog to go on it and I think I have an old 44ish front chain ring…see how that works! I just traded a Schwinn Continental for a 1969 Raleigh Superbe. I rode a few three speeds growing up and a neighbor had a Superbe, but I’ve never owned one until now. I’d forgotten how much fun it is riding one and cruising along in perfect harmony. I’m hooked! It’s a great old bike with suitable patina and it works perfectly as a 100 year bike should. Cool! But I don’t think any Superbe is 100 years old, at least not the ones you’d easily find! Snark aside, does it look like this? If so, that’s the standard shifter of the 50’s. They were optimized for drop bars, so the shifter “hangs” from the bars rather than “sits on top”, which became the standard from I believe the late 50’s onwards. I am looking for a three speed for myself and the wife and can’t find any ‘decent’ ones with a good background or reviews…..can you help.??? I have not owned a three speed since 1965….a Raleigh three speed. Thanks for getting in touch! In order to help you out, we need to know a few more things, like do you want to buy new or used? If used, how much work do you want to put in it? What’s your price range? Where are you located? Okay, thanks for more info. And thanks for making it more complicated. 😉 I kid, I kid! Snark aside, most modern three speeds you are going to find will be made in either China or Taiwan. 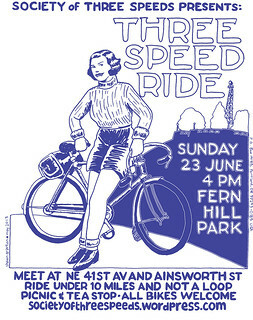 Three speeds tend to not be expensive bikes, so they aren’t usually going to have “high end” parts. But the parts on most of these modern three speeds, be it Linus, Public, State, Brooklyn, etc. are going to be okay. (It’s sort of amazing how well even cheapish parts work these days, vs. bike boom era.) As for the Linus, my ex-gf has had one for five years, and likes it, so take that for what it’s worth. To get more upscale three speeds, you’ll have to look to the other side of the Atlantic. You can get some Dutch bikes with three speeds, but they are also heavy. I just sold my original ’65 and my “Custom Built” ’66…yes, I toyed with the idea but the 27″ days are gone, 700c is now…..I might as well get with the ‘new’ program and reduce my “down’time for repairs upgrades etc…..and rhe Huret derailleurs….I think they were made from re-cycled tuna fish cans…they stunk…..!!!!!!!!!!!!!!…. Have you looked on Craigslist? They are nearly always available here in Buffalo. Right now someone has three Raleighs with women’s frames at $325 for all of them. They’re looking for NEW, not used. Indeed, there are many a Raleigh on Craigslist. The Scajaquada is still a nightmare that should never have been built. There is a plan to slow it to a parkway. I used to commute by bike from the citb to a suburban job, past the Republic Steel plant. That site is now the just opened Solar City plant. It won’t have the 30,000 employees the various steel plants did, but it is a big piece of our new economy. Still a great place to ride 3 speeds here. The three speed worked for the same reason the Ford Model A did – it was adaptable and reliable for performing a wide variety of common tasks in a reliable way. The features on the bikes solve a number of common problems in commuting and utility bicycle work. The main issue with American-made three speeds is that you have to get past the pile of 1970s-era junkers to get to the good stuff. In terms of U.S.-builders, Schwinn and Westfield/Columbia made the best 3-speeds in the 1930s-50s era. I agree – they’re an equal alternative to Raleigh if you prefer their style and designs. Quality from a number of U.S. companies dropped off in the 1960s (Columbia is a great example. There’s no comparison between a first-rate 1941 Sports Tourist and a clunker 1970s three-speed). It didn’t help that the 3-speed increasingly became bargain basement department store fodder in the late 1960s and 1970s more generally. During the bike boom, junker 3-speed with oriental hubs and lots of plastic parts were made by the million by several American companies.